1. Cross country bike ride: This was the only activity I didn’t pay for, thanks to invite from Thailand Tourism Authority. The longest one of all, lasted 1 week and 2000kms. The biking trip was well documented on NDTV Good times and was aired recently. Enjoyed riding powerful bike in the company of amazing riders. Got to explore most of northern Thailand, which I might not have explored on my own had it not been for this event. If organized on our own, such trips can cost INR 1.5 lakhs onwards. Read more about Ride Thailand here. After this trip I am resisting heavy temptation to buy a fast bike. Except the biking expedition, all other activities were tried in Karnataka itself, not anywhere else in India or world. Indeed Karnataka offers wide range of adventure sports option- check this post for details. 2. Skydiving: At an expense close to 30k, it was a luxury indulgence. But the 35 seconds of free fall was all worth it. 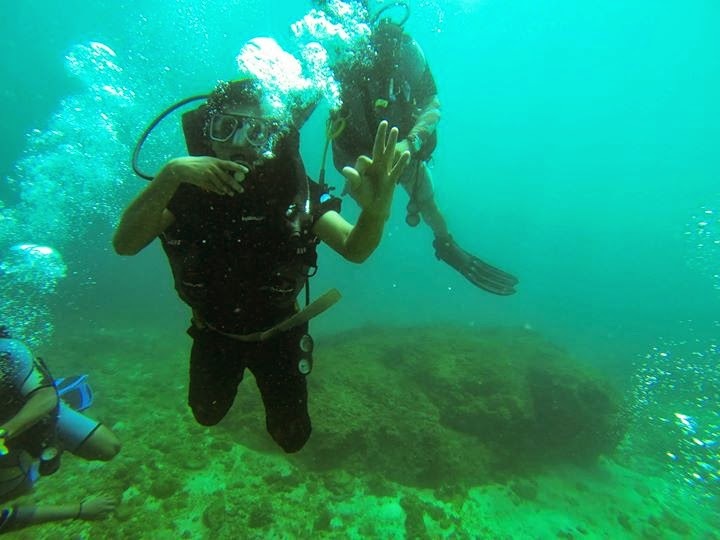 Should try few more dives- probably a solo when situation permits next time. 3. White water rafting: Kali river is the best place in Karnataka to try rafting. We did it in Jan, which was the right time. The 12 km ride had a few rapids and we enjoyed our moments in water, while heading downstream on River Kali. Unfortunately I don’t have photos of this activity, but then, there’s always another time. (We can try rafting in Badhra river, Kaveri river and River Sita as well). At Rs 1400 per person, white water rafting was the cheapest of all adventure activities among ones listed here. 5. Microlight flying: You don’t need a pilot’s license to fly. With a trained instructor besides you, everyone can try their hands controlling a small plane. Microlight flying involves going up in the air, to a small height of about 1000 ft and then making minor navigations of the plane under the guidance of the trainer. I wasn’t even aware that one can try this in Bengaluru all these days. I have few more items in my wishlist- hot air balloon ride, skiing and desert safari. But nothing planned in near future. My next challenge will be to drive around in Northern India and return the car without any dents and scratches. I guess that will be far more adventurous. When you get old, you’ll regret about things you wanted to do but never managed to, than things you might have achieved – such as house and cars. Don’t give that a chance. If your heart is on something, go ahead and do it.